3. Take the bacon out and wipe most of the grease out of the pan, but don’t clean it. 4. In one bowl put the corn meal, flour, baking powder, and salt. Cut the butter into pieces and mush it into the flour mixture with your hands till they are small bits. 5. In another bowl, whisk together the eggs and milk. Add this liquid to the flour mixture. 7. Put this all into the skillet—hopefully still warm from cooking the bacon. 8. Put it in the oven and cook for 20 minutes. Eat hot and fresh and add honey if you want. Bacon seems like a great addition no matter what you are cooking. Thanks for the cornbread recipe. Your recipe sounds great! I will definitely try it, except instead of milk, I will use nonfat buttermilk and will probably omit the butter. This will cut the calories and will be just as delicious, I am sure. 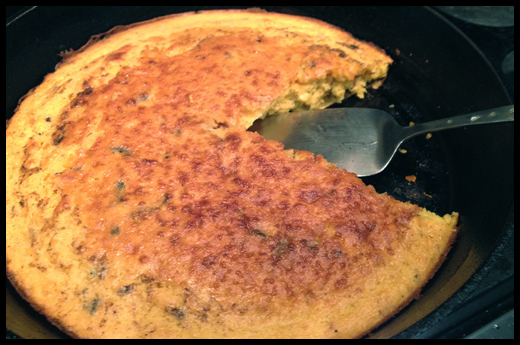 Cornbread can be “spiced up” in many ways, and is one of my favorites with soups, chili, stews, etc. or even by itself! Thanks for sharing. Today I woke up with a hankering for good cornbread too. I think I will use your recipe, since it looks so good, and I will also try to find a can of nonGMO corn (or frozen) to add, because I like that extra touch of whole kernels!